It was interesting to watch some of the court side coaching interludes when GB played Slovakia recently. It was great to see Dan Evans seal the win under pressure in the deciding rubber against Slovakia but I was unsure what coach Leon Smith was aiming to do at the changeovers. While I didn’t catch the whole match, at every changeover Leon seemed to be talking incessantly to Dan. This is nothing new – previous coaches seemed to do the same – continuously talk to their charges during changeovers, maybe they see this as their way of justifying their existence as captains. While it may have been seen to work with Dan, it can hardly be effective. As human beings it is doubtful we can take in a constant verbal stream throughout a 90 second changeover. A more interesting story of man management came up in Spain’s victory over Argentina in 2008. Verdasco playing Acasuso was 2 sets to 1 down, with the Argentinian crowd going wild, when at the change of ends he told Emilio Sanchez (the Spanish Davis Cup captain) that he couldn’t play, as the crowd was getting to him. 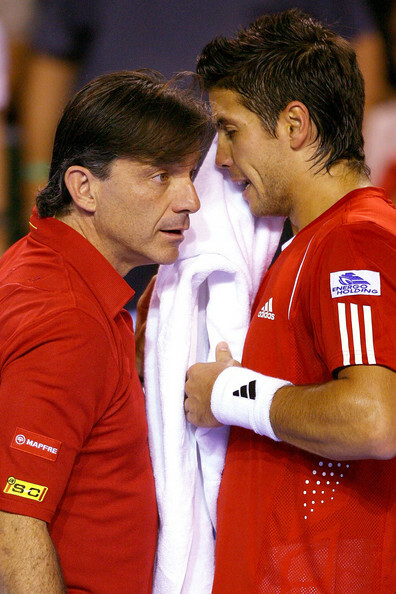 At this Emilio started packing Verdasco’s bags up – asked what he was doing, Emilio said that as Verdasco was unable to play that was ok they would quit and Verdasco could explain to the people of Spain why. Verdasco went on to win in 5 and seal the Davis Cup for Spain. “It’s amazing,” said Sanchez Vicario. “It was an incredible match of ups and downs. In the end Fernando was the better player. “It was very tough for us because Fernando was fighting with the crowd and not listening to us. Often it’s key interventions that make the difference not simply a constant stream of information that’s not readily absorbed! This entry was posted in Coaching by aitkenhead. Bookmark the permalink.